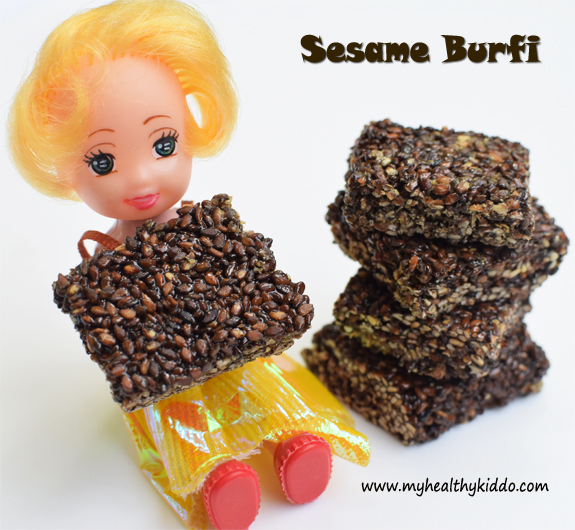 Sesame seeds are rich in vital nutrients that we and our kids require – Calcium, Iron, Protein and much more. 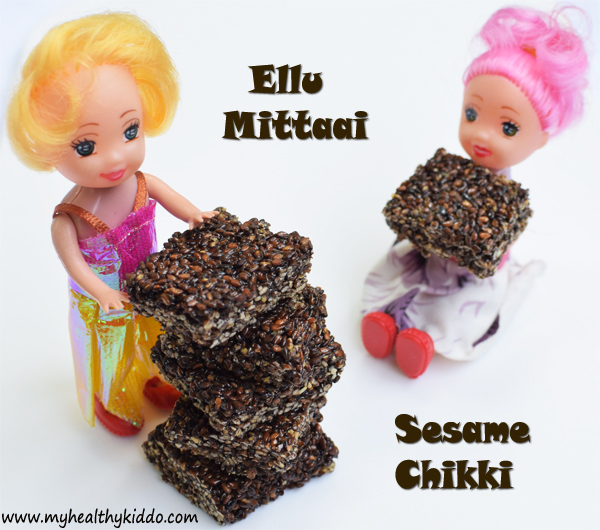 This chikki is naturally more nutritious than the energy bars available in the markets. This is much easier than the peanut chikki(Click here for recipe) that I posted earlier, as it has no chance to flop. Though the method is same, even if you go wrong in jaggery consistency, this chikki would taste good. As sesame seeds are smaller compared to peanuts, even if you make it chewy, it will still taste good. Do give a try. 1.Dry roast sesame seeds until nicely pops up. Make sure not to burn it. Keep a bowl of water ready for jaggery consistency check. 2..Add water and cardamom powder to grated jaggery. 3.Let it boil till jaggery dissolves well in water. Then filter jaggery for impurities and add it to another pan. 4.Boil well till jaggery syrup thickens. In a bowl of water, pour few drops of syrup. Syrup should stand firm in water. If you take out and roll into a ball, it should roll into a hard ball. If you drop the ball back into water with a force, you should hear a “dong” sound. This is “hard ball” consistency. Switch off the stove immediately. 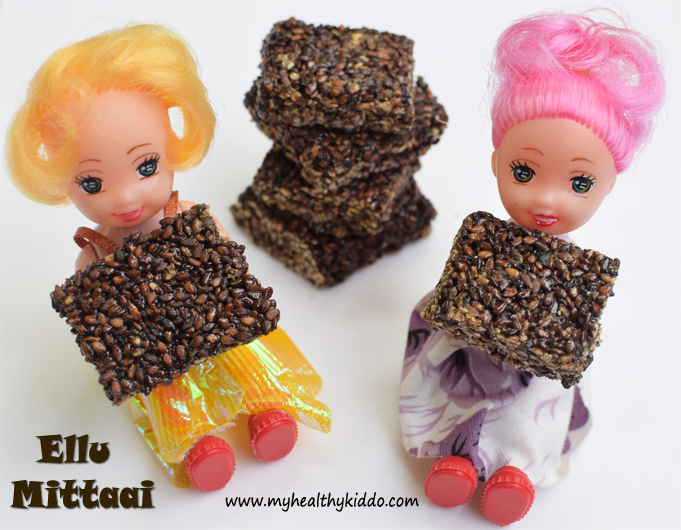 5.Add roasted sesame seeds and quickly gather them to a mass using a Spatula(Karandi). Grease chapathi roller and base with ghee. 6.Transfer sesame mass to greased base. Roll it using greased chapathi roller. While rolling, adjust the sides using hand and roll it into a square. 7.Use sharp, ghee-greased knife to cut horizontally and vertically to make small squares. Leave it open for half an hour. Then, transfer to air-tight container. Enjoy every bite !! You shall replace cardamom powder with dry ginger(Sukku) powder.